I love the generosity that exists among quilters. Being a self-taught quilter, I know how to do what I do thanks in large part to tutorials and illustrations in books. So in a spirit of reciprocity, here's a little tutorial on the dryer-sheet applique method. This method can be used for a variety of shapes, but I'm working with circles here. Place a used dryer sheet on the right side of the fabrics (here a scrap from two fabrics), pin to stabilize, and draw the circle. I used a CD. Cut all the way around, and sew a scant 1/4" seam all the way around the outer edge. The back side of your fabric should look something like this. Pinch the dryer sheet away from the fabric and cut a slit in it, 2" long or so. Reach in through the slit and turn it inside-out so that the right side of the fabric is now on the outside. Use a poking tool of some kind and press so that your circle lies flat. And you get some nice little circles, ready to be appliqued onto your fabric. The dryer sheet is thin, and a nice zigzag stitch is easy to do! 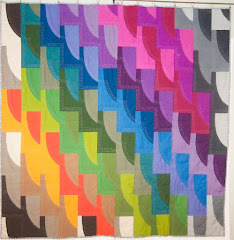 Thanks to Sue Ryan who demonstrated this method last July at the Chicago Modern Quilt Guild. 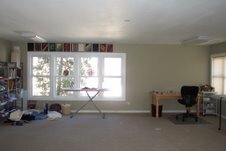 And here's to whittling that fabric stash down in 2012! These are just the blocks so far. Not the setting. I am loving how this is taking shape. What a great way to end 2011 and start 2012! 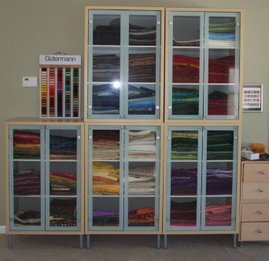 My main dilemma - and it's such a good one - is choosing the quilt I want to do next. I've been going through my design notebook, looking at the "Inspiration" folder on my computer, and assessing my fabric stash. I bought a bolt of a light bone Moda, thinking I want to do something light. But for this time of year, dark is calling to me. So are my batiks - in fact, they are clamoring to be used. I'll save that bolt of bone for the summer. So here are all my batiks. Now what to do with them. What I love most about these fabrics is their coloring changes depending on what a fabric is paired or teamed with. And some of these pieces are small. Whatever I do has to be scrappy, unlike the quilt I did for my nephew Nathan, highly planned with only 3 batiks. These blocks are 6.5"x 8.5", made from 2.5" strips cut at 4.5" and 6.5". So far I'm doing 4 blocks from each pair of fabrics. As I get further into the project, I'm hoping to set these blocks directly next to one another. But I'm also thinking that I could use something dark, a black perhaps, to square off each block and create a woven effect. And of course now that I'm searching for an example of what I want I can't find it. For half a day I did consider doing something with dots, big ones, made from my scrap table and dryer sheets, the dryer-sheet applique method. I will do this project at some point - it does have possibilities. And this leads into the biggest dilemma: fabric. I have too much. So what do I do? I buy more. Seriously, there are some fabulous on-lines sales. Then I become more determined than ever to use scraps, which is where I'm starting with my batik project. Using the smallest bits first. What fun dilemmas! Monday was a phone day with my mother's medical people. You know the drill: you call, leave a message, wait for the office to call back. I'm not complaining, just stating. Tuesday was hanging out with my parents, which means driving around and listening to accordion music and having the same conversation with my mother again and again. My poor mom just cannot grasp where she lives or who she lives with. Or what day it is. Or how old she is. Or that my father doesn't drive anymore. Or that she doesn't cook. Wednesday I went to the studio, ostensibly to do some putting away, cleaning, sorting, and organizing. But I got distracted by these three green materials and the duffel bag pattern that I've made once. I decided to kind of wing this pattern and inadvertently made this duffel 27" wide instead of 21" wide. But it still works nicely. The studio may still be messy. But I feel better. If this book is one you haven't read, then get a copy somewhere. It's beautifully illustrated and is the essence of the quilter's soul. I've been living this book the past few days, giving away the bags and totes I've been making - to my doctor, to my parents' doctor, to our dentist, to my yoga instructor. What a luxury to give away what I make. What do you do with those pesky t-shirts and medals after you've run a marathon - or a half-marathon? That was the problem Chandra (my own personal physical therapist) and her family had after all of them finished the half-marathon on Oak Brook last September. So I suggested a wall hanging, and here it is. I'm very impressed that Chandra did the 13.1 mile run/walk. She's someone who definitely practices what she preaches! Being at a church was a nice, safe venue. And the other vendors were all nice people, too. The bonus of the day was hanging out with my sister-in-law. I need to send the church 10% of my profits - $25.00. It was nice today to be able to restore some sort of order to the studio and work on a few things which I've been wanting to get to. And whip up just one more Mors bag. This one is for my dentist who is also a violinist. This bag is one that John is giving to a woman at our bank who's been extremely helpful to us in the past year. My brother Doug and I were driving to a family funeral in Indiana years ago, perhaps the one for Judy White, my cousin Bill's lovely wife who died way too young. And I remember we had a long, extensive conversation about the profit motive. We come from a family where profit wasn't part of the work equation. Of course my father worked, but he was paid for his piano tuning and he was paid union scale for his accordion jobs. My years of teaching? Of course I made money, but none of it was profit-oriented. So to sell my work for profit - it's just something I'm not comfortable with. Pricing my pieces was difficult. But once I did arrive at what I thought was a fair price, friend Rich Seidelman made this wonderful graphic which I had with me yesterday. I value what I do. But I like giving it away much more than I like selling it. 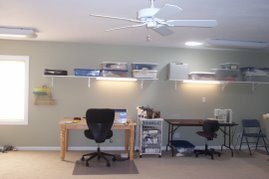 My sewing flurry is over, and everything has been packed. 10 Amazing Technicolor Dream Totes, 4 Red Scrappy Dream Totes, 20 shopping bags a la Morsbags, 30 mini gift bags, 6 envelope purses, 2 MiPad cases, 4 Hobo bags, and a couple of one-of-a-purses. I've never sold my wares at any kind of venue. But tomorrow's event at the LaSalle Street Church seems a good place to start. And it's only for 10 until 1:30. And one of my favorite people, John's sister Chris, is coming with me. These little mini-gift bags were a last-minute addition, mostly because I wanted to have something inexpensive on table. I'm bringing this coat tree to hang things on, and I also have a wonderful poster, thanks to Rich Seidelman, displaying my bags and prices. Here's to trying something new! Here's how to get eight little gift bags from one yard of fabrics. Cut 8 pieces that are 9" by 20". Make a small hem ( 1/2 - 3/4") on each end of the rectangle . For handles use something - ribbon, binding - that is 12" long. Insert handles one inch on center at both ends of the bag. Like with the directions for Morsbags, sew the handles into the hem and then fold them up and sew another line of stitching. These bags won't be lined, and French seaming will take care of the raw edges. With wrong sides together, sew a 1/4" seam starting at the top of the bag, on each side. Then trim these seams down to 1/8". Turn the bags inside out, press, and then sew a 3/8" (or so) seam, encasing those raw seam edges. These little bags work best if they are "boxed" so cut a 1" square out of each corner. Do not include the seam allowance in this! Open up those corners you just cut and find the straight line. The center of this seam will be the side of the bag. Sew a 1/4 - 3/8" seam. What you have at this point is essentially like a paper grocery bag. So iron it like that. And remember: Steam is our friend! Now find a gift certificate or some candy or some little sewing notion and some tissue paper - and VOILA! My grandson Ryan, a junior at Lyons Township, asked for help on his Spanish assignment. He needed to make an arpillera. A what? And he said slower and louder, an arpillera. He then explained that an arpillera is like a small quilt which makes a revolutionary statement. Arpilleras began in 1973 during the reign of the Chilean dictator Pinochet. Women created complex tapestries depicting the harsh conditions. And this movement has extended outside of Chile to other South and Central American countries. Ryan and his partner have to create an arpillera and do a 10-minutes speech/PowerPoint presentation about arpilleras in Columbia. It's due tomorrow. I showed Ryan how to use double-sided fusible webbing (Steam-A-Seam) so that he could cut out the shapes of what he wanted, position them, and then iron them down. Part of the arpillera had to be 3-D, so he stuffed the clouds with cotton (Yes, this kid "invented" trapunto!!!) and made the banner drape. He also did his own binding by machine. (I have his permission to write this blog entry but not to "tag" him, which I understand. He then suggested that I refer to him as just a kid in my neighborhood - I think not...). The artists who make arpilleras use their sewing as a powerful creative political tool and a catalyst for change. I'm glad Ryan had this assignment and to know about this art form. We had our final meeting of 2011 today. What a good year it's been with these women. Today's meeting was a sew-in, but there were a few other things going on. Of course we had a show and tell. I'm just amazed by what my fellow guildsters do. There was a Scrap Bag Swap, which I couldn't bear to be a part of. Actually I should have brought in bags of scraps -that'd be one way to reduce the piles on my scrap table. And the final round of the Round Robins has been completed. Here's a picture of my piece. It started with my applique of the three cirlcle in the middle. Round Two was "rectangles", and Rachel did this part. Sarah S used some fabulous Oriental prints for the "diamonds" portion. Holly then added the next round, which features "curves." Sue had the final round and used Flying Geese as a way to interpret "triangles." I am floored by this finished piece. It has a unity and flow even though five very different quilters worked on it. And I think that was true of each one of the Round Robin pieces I saw today. Friend Ebony gave me a purse today, one she designed and made. I've touched it and drooled over it for the past few months. All my hinting paid off! The adjustable strap allows it to be an over-the shoulder or across-the-body bag. It's a generous size and of course beautifully constructed. Temtex gives it some wonderful body! She has named this bag "Mulberry," an obvious choice. Check out the zipper in the final picture. Ebony also gave me a furishiki, which contained a lovely pair of earrings. How much fun to have such a generous friend and mentor! I love guild meetings because I can see what the Emilies are doing I can check in and reconnect with fellow officers Beth and Jen and Terri. I can meet new people, like Jacquie and Tina and Tricia. I can get to know Sarah E, Holly, and Mimi better. And I can see how Erika is developing as a quilter. Eileen made me a generous offer to check out her Home Dec stash. Sarah S is doing her first "life celebration" quilt and wanted to talk about the process. Sue continues to amaze me with her idea and choices - her idea for and execution of the Round Robins? Genius. Karen stopped delivering babies long enough to come with her friend Jennifer S. Rachel dropped in despite her daughter's first cheer competition. Connie, Robbi, Sara H, Michele, Mary, Yolande - talented and interesting women. I will quilt Christmas trees, but that's the extent of my decorating interest for the Christmas season. Good thing my husband is Mr. Christmas - he decorates the house, puts up the tree, does the Christmas shopping, AND even wraps the presents. Our friend Richard Seidelman worked on the McDonald's advertising for years and always sent us a yearly Christmas poster. And John faithfully displays them on the side of the hallway bookcase. But it gets even better. Brother-in-law Jerry Hicks created this Bubblelabra, which sits in our front window and bubbles away all day and night. It's beginning to look a lot like Christmas!